Cabin Sole — O'Day Mariner #1922 "Orion"
All boats have a common problem - they leak, whether it's a lot or just a few drops. My boat weeps water near the V-berths - I suspect the foam is waterlogged (that will be replaced next year). Other problem areas include the centerboard pivot bolt, thru-hulls, portlight frames, improperly bedded hardware... you know the deal. I got tired of having gear slide off of the berths while sailing and then get wet in the small puddle that had accumulated in the forward bilge. 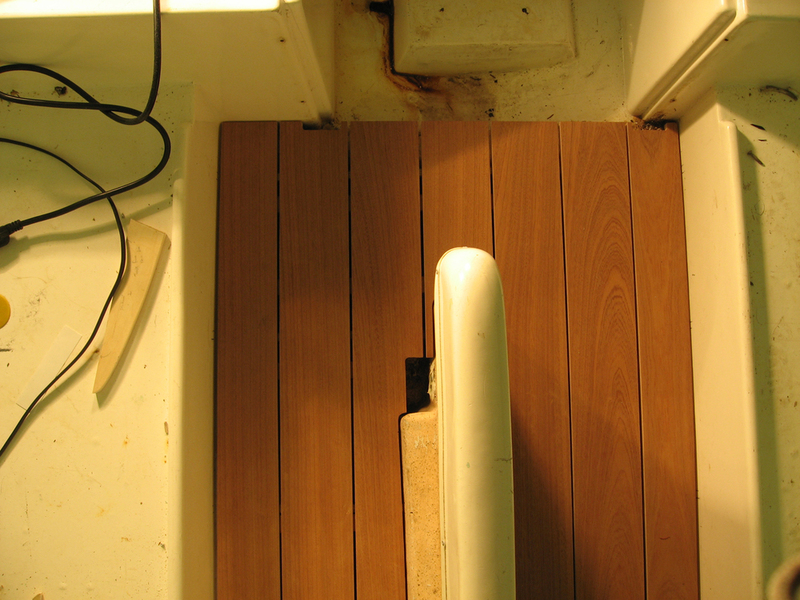 Therefore, I decided to make a new cabin sole that could be removed in a hurry, yet it would be stable and look nice. I had originally thought to make it out of mahogany boards, but after a conversation with my wallet, I decided to go for something just slightly less expensive - mahogany plywood. Still expensive stuff, but at least I could use the leftover plywood for new hatchboards. The first part of the project was to make stringers to put on the actual sole of the boat - these in the pictures are just plywood prototypes duct-taped into place. I'll be using G-10 with slots cut out for the permanent addition. I used the technique of "story-boarding", or "story stick", or "joggle stick", or whatever you want to call it. I was able to duplicate all the curves of the boat extremely accurately. I learned all about it in the January/February edition of the WoodenBoat magazine - it's a 19th century technique, and it works very well. 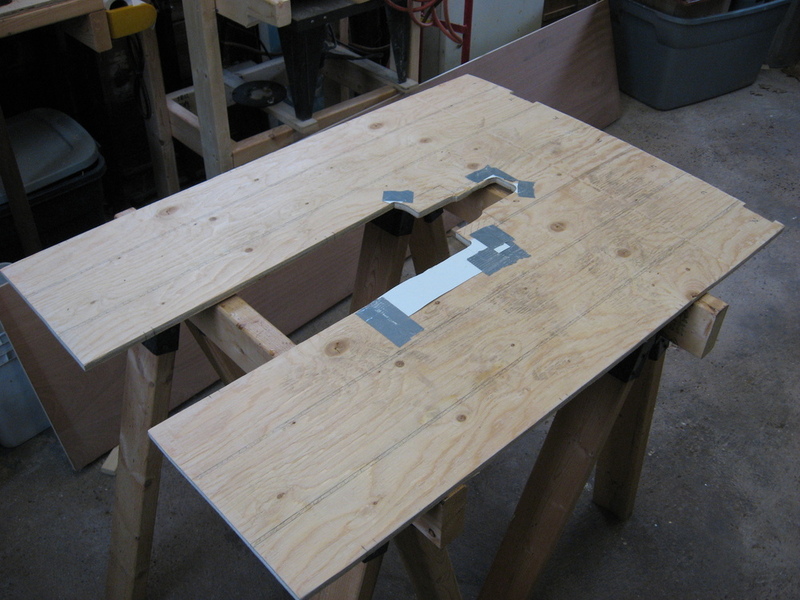 I clamped a board to the side of the centerboard case, made sure it was level, and then traced away. Here's a website that describes how to do it. After I made the stringers, I again used the story stick technique to get an outline for the new sole. I suppose you could also just tape pieces of cardboard together, but I found the story stick to be extremely accurate, and rather fun to use. After I made my tracings, I transferred them to a piece of CDX plywood - I was certainly going to make a prototype before I started cutting the mahogany plywood! It fit extremely well right off the bat, and I ended up using duct tape to tape down some white pieces of cardboard where I needed to "replace" wood and make corners accurate. As I'm sure everybody knows, NOTHING inside is square or symmetrical, including the centerboard trunk - it fans out a little as you get closer to the forward end. Also, I remembered at the last moment to measure for the little slots on the forward end for the two wooden vertical slides at the front of the porta-potti compartment. I kept procrastinating before actually taking a saw to the nice mahogany plywood I bought. I finally reached a point where I said to myself, "I'll never finish it if I don't actually start it," so I made some final measurements and just starting plowing ahead. I cut 4" strips, laid them down on top of the CDX template, clamped them together, and traced all around the edges where the centerboard trunk would be. I put bits of 3/16" pieces of wood in between each board so that the finished product would allow water to drain through. I then took each board, cut with a jigsaw the traces I made for the centerboard slot, and used a hand plane for the port and starboard sides. Some minor sanding took care of anything else. I took the sole to the boat, fully expecting to make some marks as to what I should adjust, but everything fit so well, I didn't need to do a thing. Once varnished was applied, it looked absolutely outstanding. Now that has been a number of years since the cabin sole was constructed, I can say that it has gotten a little scratched up despite a couple of coats of varnish on it ever year. Also, if I were to do it all over again, I would probably try it with mahogany boards instead of plywood since I had difficulty properly sealing the plywood edges, resulting in some moisture getting inside. Oh well - it's a boat, not a piece of furniture, and it shows how much the boat is used, right? Regardless of how it may be showing a little age, I can say with certainty that it is extremely functional serving as a level, stable platform allowing bilge water to collect underneath it without getting anything on top of the sole wet. And it still looks great!